Carefree, laid-back, free-spirited and romantic. If you would like to plan a boho wedding, here are a few ways to incorporate this trend into your celebration. 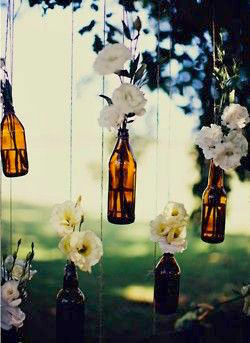 Hanging bottles and flowers for an outdoor Boho ceremony. Romantic, relaxed and unexpected. The boho wedding draws influences from hippie culture, mixed in with gypsy and vintage elements. A trend that started a few years ago and became a classic. What is the bohemian style and how do we plan the boho wedding of our dreams? 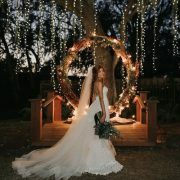 A bohemian styled theme or boho wedding is one that obeys no rules, as shown by its freedom of expression and frugality. An eclectic mix of hippie, ethnic and gypsy styles revealed by simple, artsy and adventurous touches. Why is the Bohemian wedding theme so popular? First, a lot of couples identify with the simple, anything goes, DIY filled style of a boho wedding. 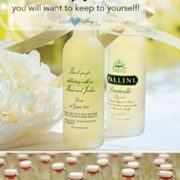 It allows for many ways to personalize a wedding. Second, because of its frugality, it adjust to even the smallest of budgets. Couples nowadays are more budget-conscious. Savvy-brides know that they can plan a boho wedding on a tight budget. 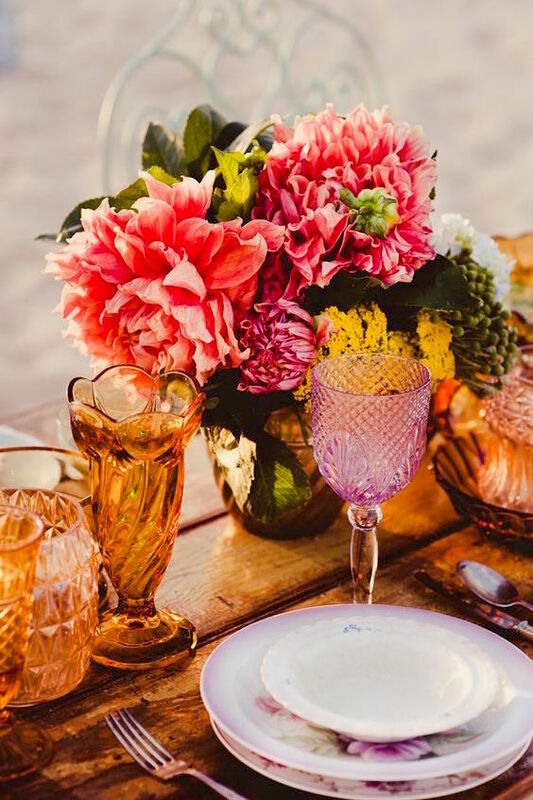 The good thing about the Bohemian style is that brides can pick either a Boho vintage, Beachy Boho, Boho Chic, Wanderlust or Woodland themes according to what fits their personality best. Third, being loaded with textures, prints, and the beauty of simplicity and freedom of spirit, no other style compares. 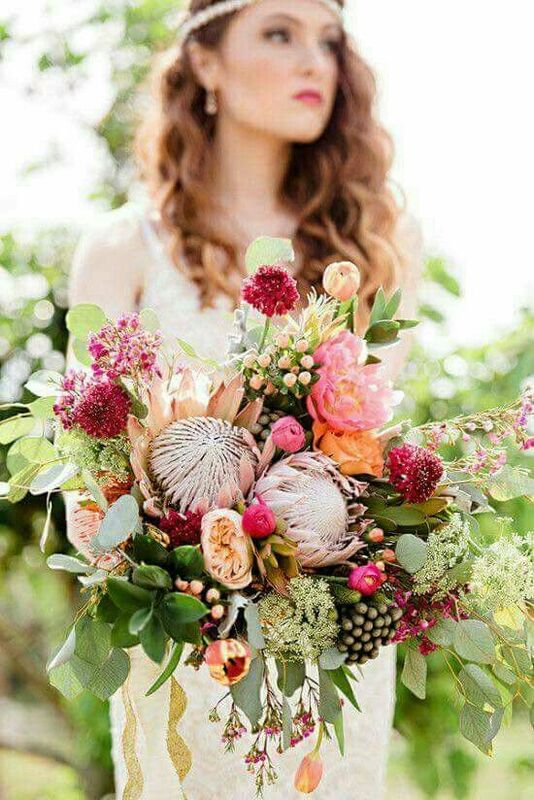 Carefree boho chic bride with a stunning wildflower bouquet. A cool boho wedding is non-traditional, has a sense of adventure, and gives you a memorable wedding without the stress of a high-maintenance reception. The first thing you have to do, is define your inspiration. What does Boho mean to you and your partner? Do you see flower crowns and a garden setting? Do you dream of sunny beaches and waves crashing behind you? 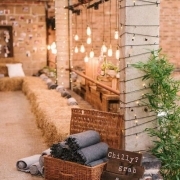 A reception outdoors under the stars with a campfire? Or are you leaning towards an embroidered Moroccan style? Once the inspiration has been defined, pick from one or more of these elements to plan your Boho wedding. 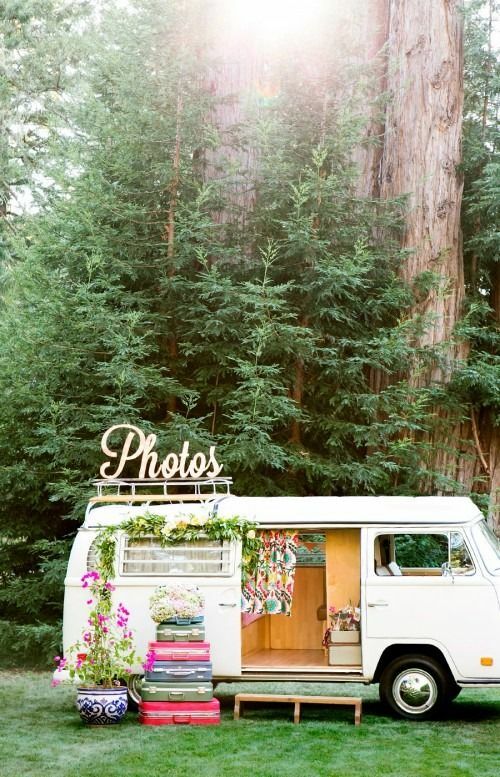 There’s a lot of photobooths out there on the wedding market, but this one does it in boho style. 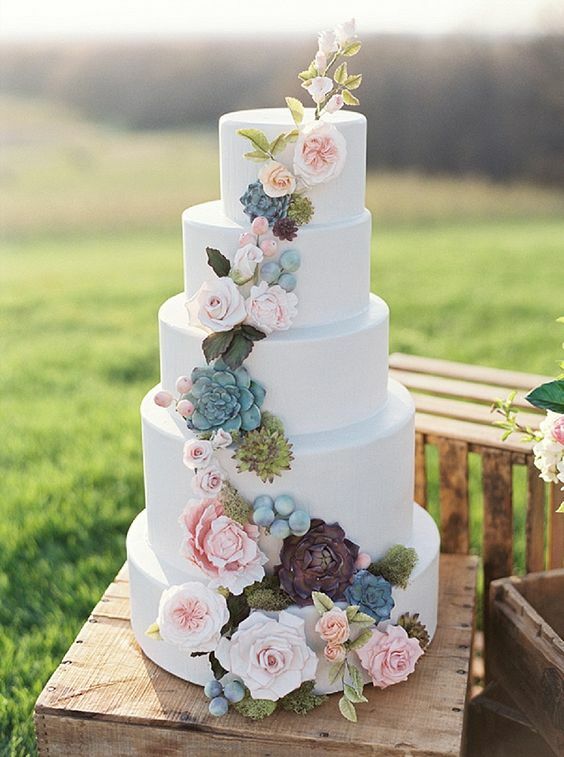 Bohemian style wedding cake with succulents and flowers. 1Plan a Boho Wedding with Flower Power! 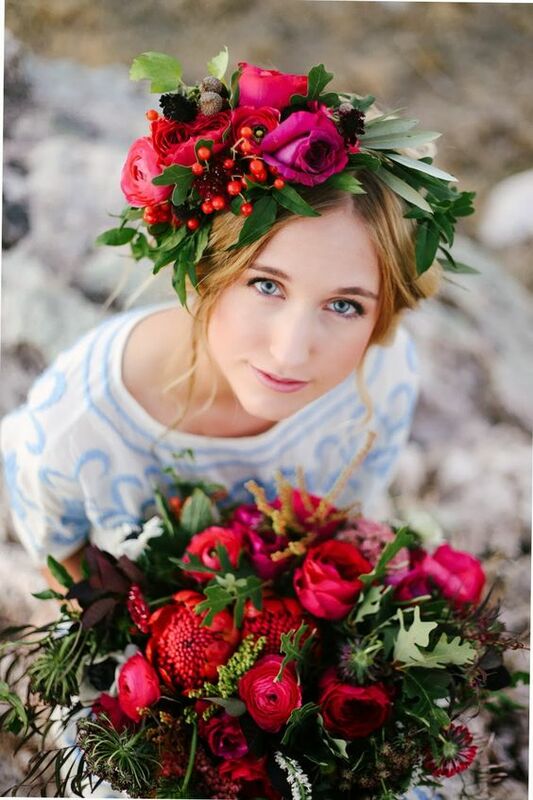 Flower crowns are definitely a synonym of a bohemian bride. Although nothing says, 70s like crystal hair accessories. To keep it frugal, make sure to pick wild flowers for your hair, bridal bouquets, centerpieces and, of course, expect a flower explosion on your wedding cake. Adorn your tables with greenery and flower garlands as the most original table runners! Romantic and boho floral crown and bridal bouquet with eucalyptus leaves. Wedding photographer: Mandi Nelson Photography. Fabrics like lace and organza are a wonderful choice for the boho bride’s dress. Meanwhile the groom can wear comfy khakis and a white shirt or a more polished but still unconventional linen suit. For an even more informal look, think of Dashikis, Indian clothes and peasant blouses, vests, fringes and the whole range of gypsy styled clothing! For beachy boho brides, welcome going barefoot! We have seen some very cute sandals that protect the bottom of your feet and barely cover them. If you are going country, feel free to don a pair of cowgirl boots. 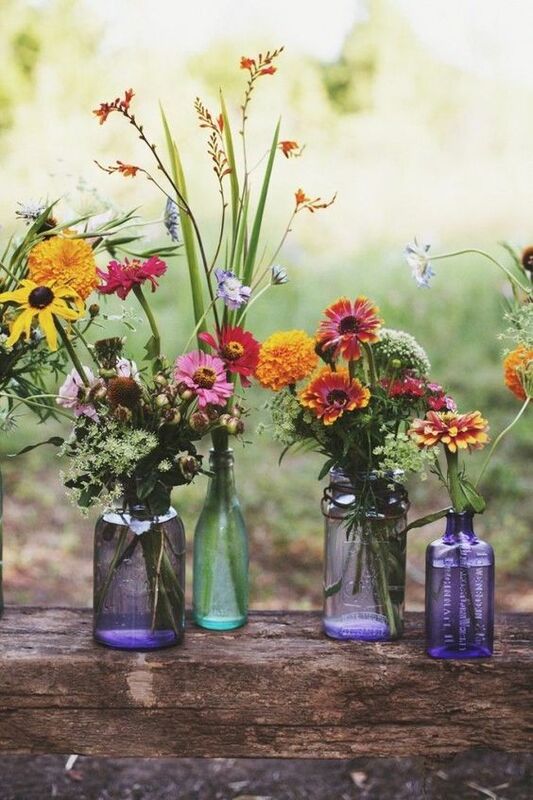 Take full advantage of the mismatched bohemian vibe for your bridesmaids. It will make it affordable for them to fit your reception style! Such amazing boho wedding dresses, the lace, the neckline, simply remarkable. 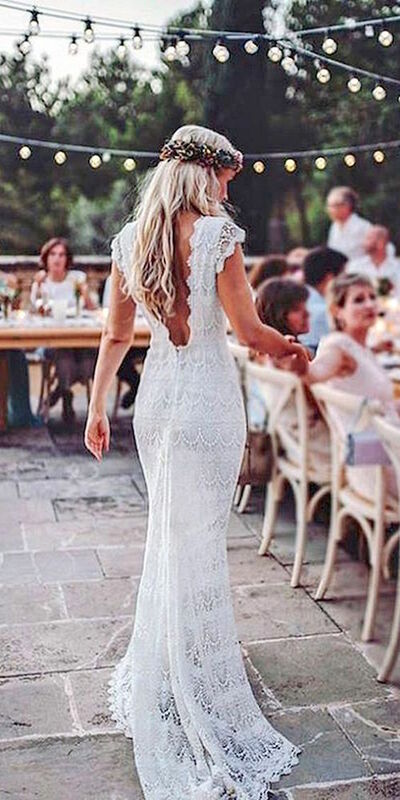 Nothing like the boho dress trend to make a bride feel comfortable and romantic. Claire Pettibone. 3How to Plan a Boho Wedding: Au Natural! A natural makeup look is the best ally of the boho bride. A touch of lip gloss, great base coverage and some pink tones for your cheeks and you’re ready for your big day! Opt for letting your locks loose, braid them and, for those who can, let your afro shine. Add a simple hair accessory like a flower crown, or a vintage hair clip that could be your “something borrowed” for the wedding. A thoughtfully styled bohemian wedding. 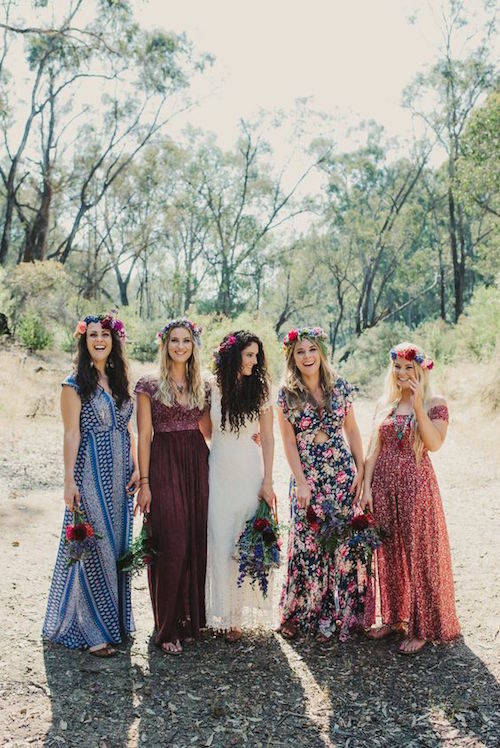 Lovely boho floral bridesmaids dresses. 4Boho wedding decor: Feel free to mix and match! Don’t be afraid to combine different colors, sets, and styles of chairs, centerpieces, tableware, pillows and textured blankets. Floating candle centerpieces, macrame ceremony backdrops, greenery wreaths, or simply group four or five pillar candles on a very rustic wooden slab to get that boho wedding vibe. Vivacious garden boho wedding ideas. 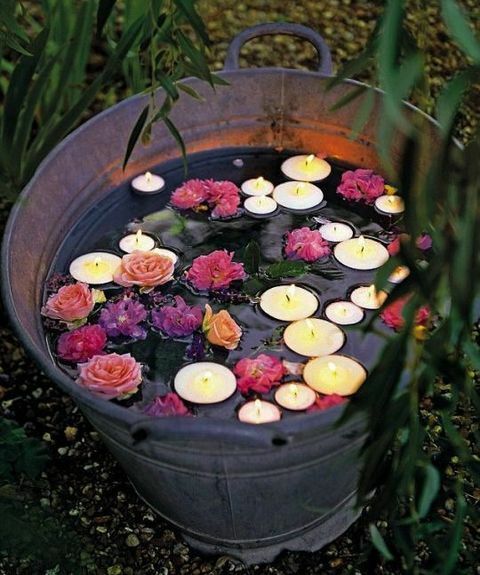 Gather a couple of buckets, candles, flowers and you have an original and carefree decor for your big day. Choose catering companies that serve non-traditional food for the wedding. The boho trend is towards food-trucks, buffet styled or BBQ-styled receptions. You can also show your commitment to saving the planet by hiring a farm-to-table caterer (check out this article to learn more about it). An artistic, carefree, and a relaxed boho vibe is reflected on the ice cubes. Easy to make. 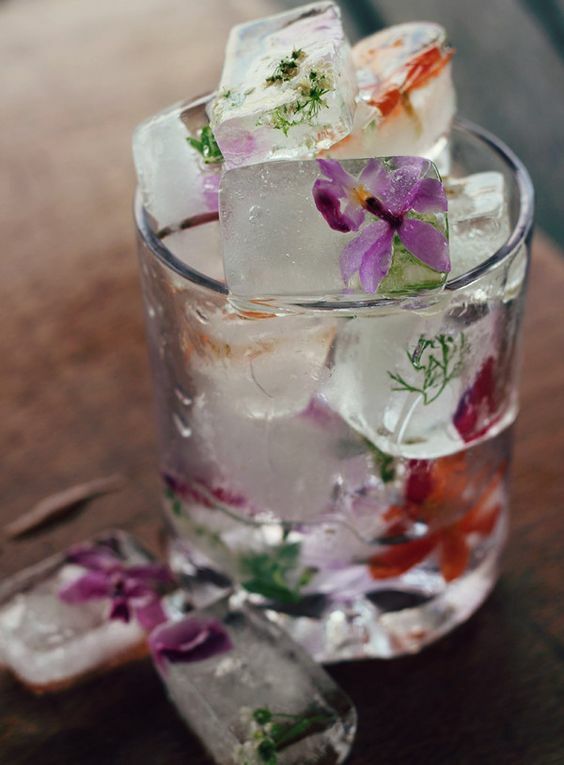 Just add a few flowers to the ice tray. Let nature become your wedding decor. Nothing more affordable than that, right? Mountains, oceans, and eternal beaches are a magnificent background for a boho wedding. And so are whimsical gardens, forests and parks. 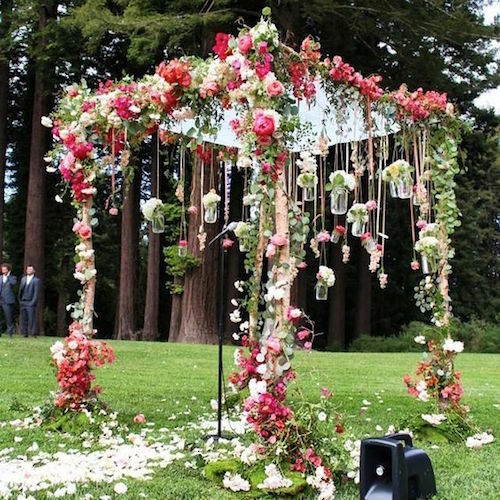 Romantic outdoor pink and red flower Boho wedding ceremony decor via Amy Burke Designs. And finally, here is a collection of fabulous photos and ideas to inspire you to plan a boho wedding! Do it yourself with cardboard circles and paper strips! 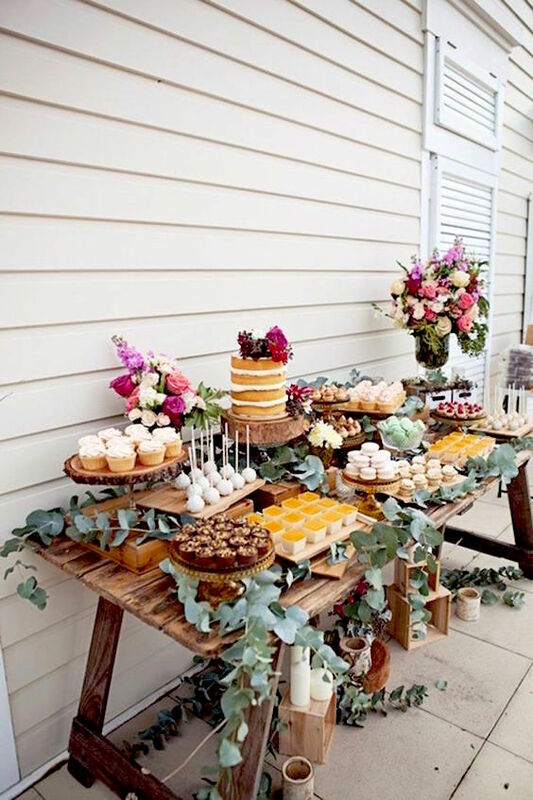 A very simple idea for your boho wedding dessert table. 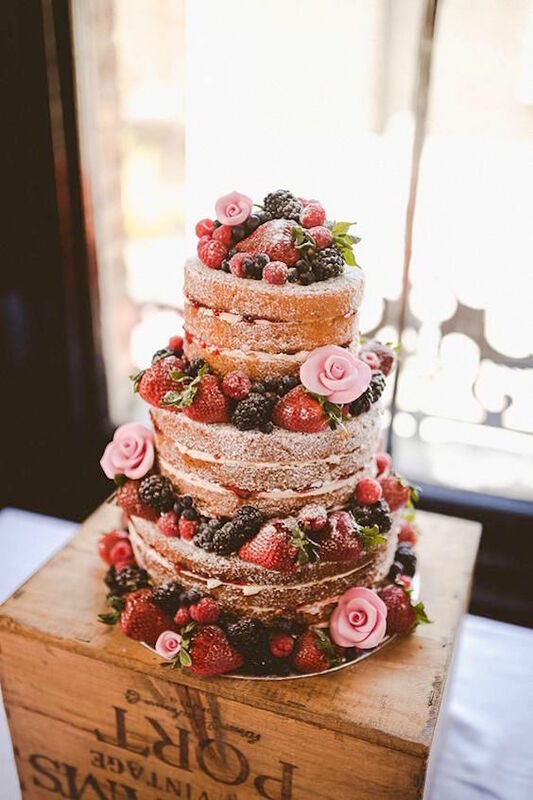 Amazing naked wedding cakes for boho weddings. A creative and inexpensive way to decorate your tables. Discover how to plan a Boho wedding! Mix and match your tableware and add some flowers like these dahlias. 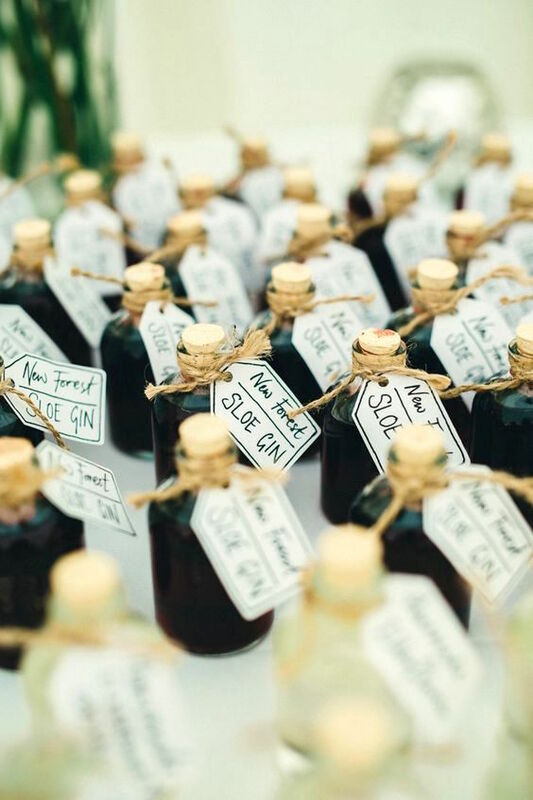 Sloe gin DIY favors for a stylish, rural and relaxed Bohemian wedding. 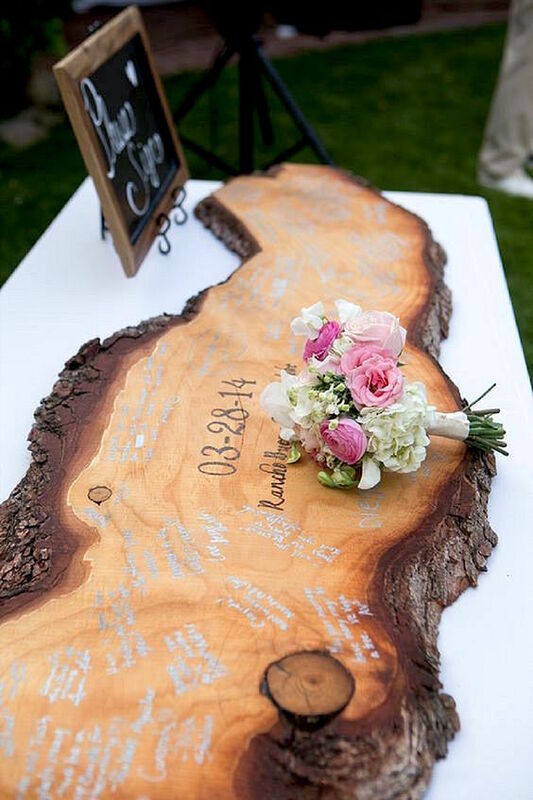 This wooden guest book is such an original idea. 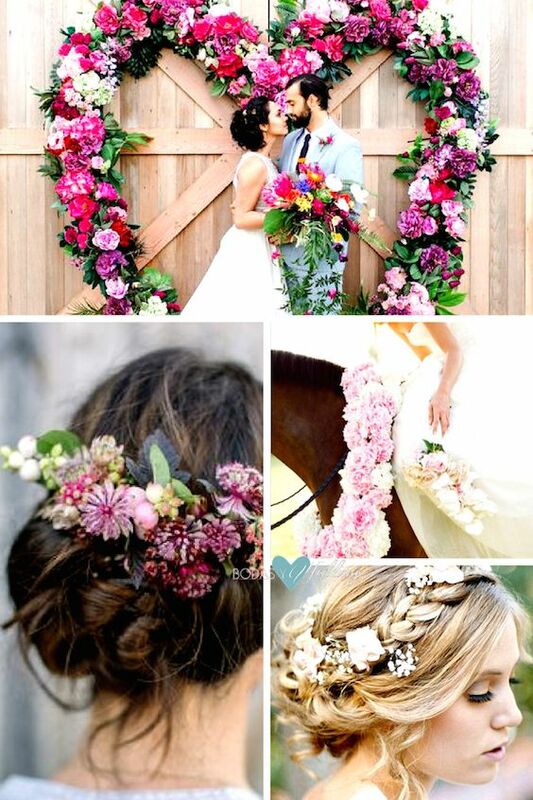 A Bohemian floral garland never looked so good! 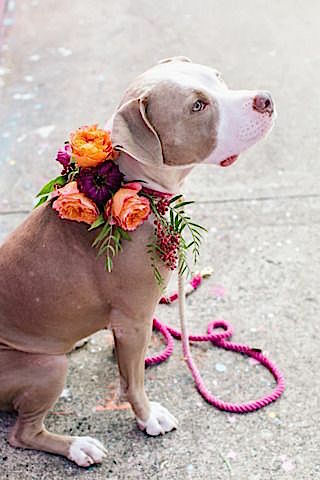 Ideas to incorporate your pet to your wedding. Do you macrame? 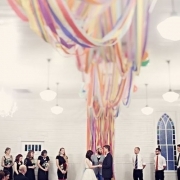 Lovely and very boho ceremony backdrop. 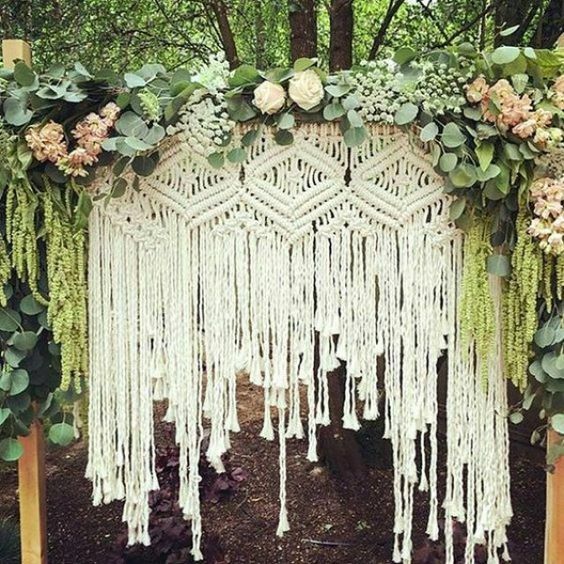 Macrame is a unique and beautiful knotted piece of art that looks amazing hanging inside of an indoor or outdoor venue. 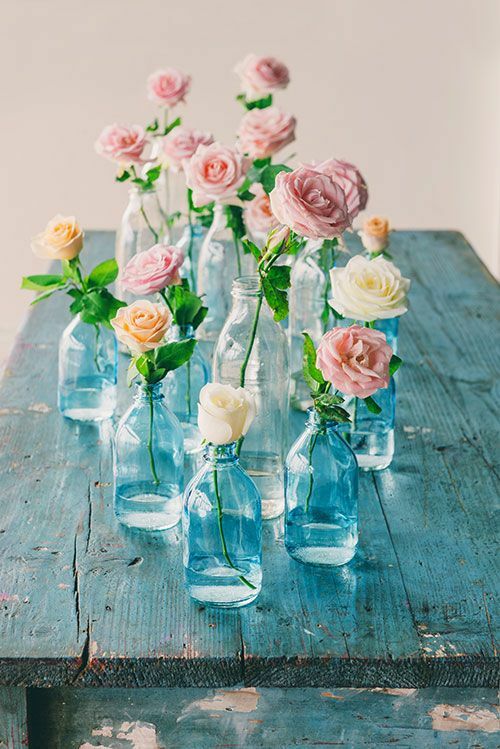 Adorable centerpieces in blue for a boho wedding. Laser cut bohemian spring flower wedding invitations (BYWWS085). 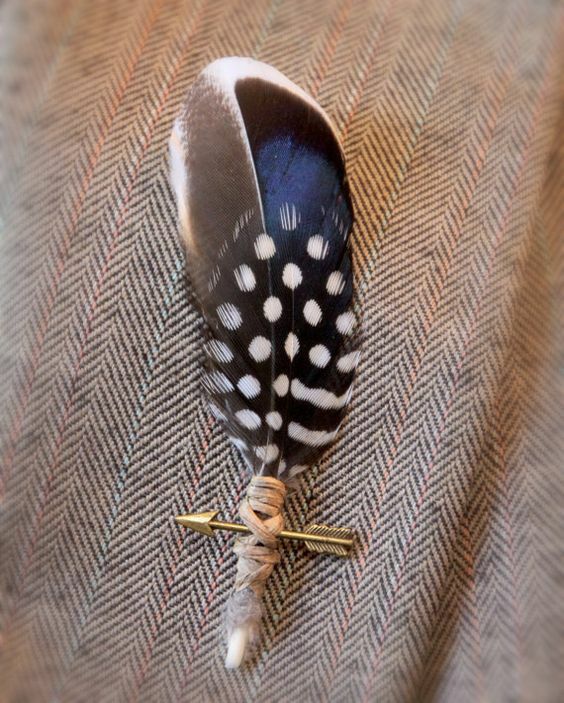 This handsome boho boutonniere features neutral feathers, a bronze-tone arrow, and a rustic twine wrap. So handsome, and loaded with bohemian charm. 05/24/17 /2 Comments/by Havi G.
Thank you for the tips!! Now I know how to make some Boho dreamcatchers!!! That sounds wonderful!!! 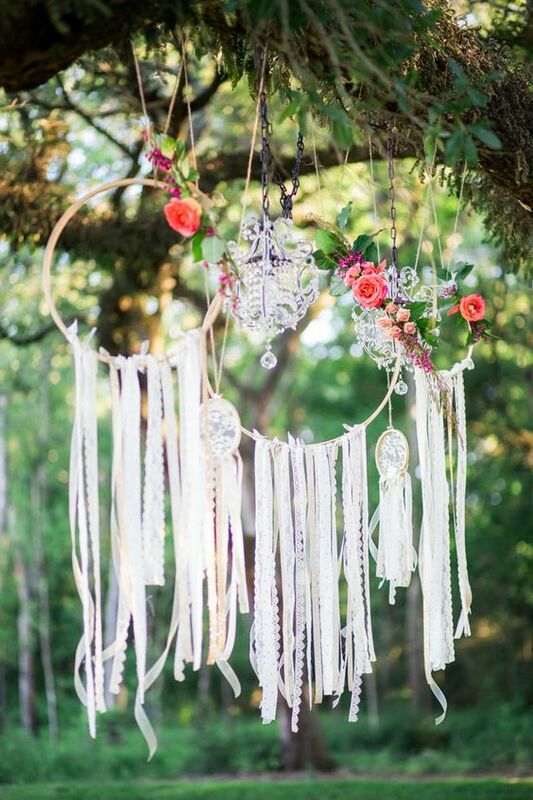 Wishing you the dreamiest of Boho weddings! !